The HomeLab computers family was conceived in the People's Republic of Hungary by the famous Luk�cs brothers. J�zsef Luk�cs, the older brother was the creator of the hardware, and the younger, Endre Luk�cs was the father of software (a great BASIC language). The HomeLab machines were cheap, well-working and easy-to-use Basic computers. They were neither clones nor licencied, but original Hungarian home computers. The HomeLab-2 (see the 'More pictures' section) was also called Aircomp-16. It was made by a little agro-electronics company called the Personal Agroelektronikai GT. Thanks to K�pes G�bor for all this information and pictures. All of the HomeLab versions could also be homebrew built or assembled by the HCC (Hungarian Computer Club), an association of amateur computer fans. The Brailab (pictured) was an exciting curiosity. It was a speaking Homelab-4 version especially intended for blind people. It featured a nice retro robot voice and a perfect Hungarian phonetics reproduction. It was a member of the BraiLab series. The text-to-speech system was conceived by Andr�s Arat� and Ter�z Vasp�ri. It was made by the Color Ipari Szovetkezet factory, in Domb�v�r, a little Hungarian city. Only 400 machines were made between 1985 and 1987. The BraiLab ran with a simple tape recorder and could be connected to either a TV set (VHF) or a monochrome monitor. A blind user could use it only with a tape recorder, hear but not watch the data. 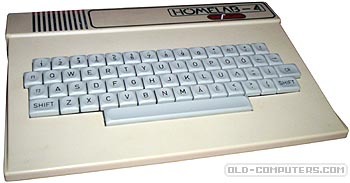 The BraiLab was followed by the BraiLab Plus with floppy and CP/M system then by the BraiLab PC, a text-to-speech interface for IBM PCs. Click here to hear a BraiLab voice synthesizer sample. (MP3 file). see more Homelab Series Homelab Ebay auctions !